Sachsenspiegel / Lehnrecht. Weichbild. Remissorium. Postilla super epistolas et evangelia. EA der Edition und mit den Illustrationen. Venice: Franciscus Renner, de Heilbronn, 1482-83. n. This item is a major achievement for a printer whose work was distinguished by the production of a number of important Bibles. Renner was responsible for at least two biblical firsts. In 1475, his folio edition was the first Latin Bible printed in Venice, and his 1480 Bible was the first quarto Venetian printing (it seems from Goff to be only the second Bible to be printed anywhere in that format). The present set is of considerable interest as a very well preserved incunabular Bible, and it is textually important as being only the second Bible with the "Postillae Literales" of Nicholas of Lyra, originally printed by Sweynheym and Pannartz in 1471. But apart from its condition and text, our Bible is of extraordinary interest because of the striking rubrication and especially the elaborate pious drawings seen here. The two illustrations of bleeding crosses constitute rare and striking manifestations of the tradition of what is known as the affective piety movement of the late Middle Ages, when there was an increased identification among mystics with the pain felt by Christ on the cross, and an attempt to experience the stigmata through meditation. Many of these mystics were women, often nuns. The devotion to Christ's passion evinced by our illustrations, combined with the naÃ¯ve style, which argues that the artist had not received as much formal training in painting as men received in monasteries, make it not unlikely that they are the work of a cloistered woman. The decoration here is closely related to a group of German colored pen drawings of the same period that, because they are either known, or presumed, to have been made by nuns, are commonly called "Nonnenarbeit," or "nuns' work." Our drawings and this corpus of German nuns' art reflect contemporaneous feminine spirituality with its emphasis on the wounds and suffering of Christ, as well as a devotion to the heart of Jesus. In the German-speaking world, the latter was particularly associated with 13th century mystics in the convent of Helfta in Saxony; the work of one of its number, Mechthild of Hackeborn, circulated in vernacular versions in German convents by the 15th century. The relationship between the probable decoration of our Bible by a nun and this larger cultural context is reflected especially by the more elaborate of the two drawings, an emblematic, rather than a narrative, representation of the Crucifixion. Although the instruments of the passion (the nails, crown of thorns, sponge soaked in vinegar, soldier's spear) are present, only the heart and blood, which so expressionistically drips from the cross itself, relate to Christ's humanity. The flowers beneath the cross, irrigated, as it were, by the Savior's blood, are also found in other drawings attributed to nuns. Finally, these images made by nuns are thought to have had a devotional function, and that appears to be the case with our Bible as well, for the marginal decoration of the creation account at the beginning of Genesis ends with a banderole inscribed with a prayer that is touching in its simple faith: "May he who created heaven and earth grant me eternal life. Jesus and Mary, my hope." Most known examples of "Nonnenarbeit" are found on single sheets of vellum or paper or, more rarely, as an integral part of a manuscript written by a nun. The presence of such images in an incunable, especially a scholar's Bible like the present item, is apparently very unusual. (For another 15th century drawing very similar in style and iconography, see the exhibition catalogue "Die Graphiksammlung des Humanisten Hartmann Schedel," Munich, 1990, cat. #21, pl. 8; for these drawings by nuns in general, see Jeffrey F. Hamburger, "Nuns as Artists," Berkeley, 1997.). 337 x 229 mm. (13 1/4 x 9"). 1,211 leaves, complete, collating as the British Museum copy, but without the "Additiones" of Paulus de Sancta Maria included in some copies (see GW 4287). Double column, headlines, text surrounded by commentary, gothic type. Three volumes. Excellent contemporary blind-stamped calf over thick wooden boards, recently and expertly rebacked and with edges skillfully renewed, 25 ORIGINAL ELABORATELY DECORATED BRASS BOSSES and six original catch plates (five other less decorative bosses, all on the same cover, probably made in the 17th century), covers panelled with triple rules, the first volume with a broad outer frame and center saltire enclosing lozenge stamps with floral or spread eagle tools, the central triangular compartments with an all-over pattern of small, linked quatrefoils; the second volume similarly decorated, but with fewer stamps, the third volume with an all-over field of widely spaced horizontal, vertical, and diagonal rules; raised bands, lacking clasps and thongs, original endpapers. First few quires of each volume with hand painted red initials of three or four lines (several with trailing scrollwork), 15 LARGE MULTI-COLORED INITIALS (predominately in green, red, and yellow), SEVERAL WITH TRAILING DECORATION, TWO WITH DECORATIVE PANELS THE LENGTH OF THE PAGE (the first initial with a charming man's face, a few additional later, probably 17th century, initials done in brown ink), TWO ELABORATE PEN DRAWINGS IN THE SAME GREEN, RED, AND YELLOW, EACH ILLUSTRATING A ROUGH CROSS, PIERCED AND BLEEDING AT STIGMATA POINTS, the larger (on two-thirds of a page) with a heart pierced by a lance and a rod and with a skull and cathedral (no doubt representing Jerusalem) at the base, the second (on a quarter page) with a motto, the rubrication and illustration all in an untutored but sincere hand. First page of each volume with ownership inscription of Lateran Canons Regular associated with a church dedicated to St. Benignus, dated 1652, and with other manuscript additions made almost certainly at the same time, including (1) the name B. P. Bormon neatly written over a portion of an inscription (that is part of one of the elaborate pen drawings), and (2) a pair of drawings in brown ink of the ark of the covenant and its cover executed in the blank spaces left in Exodus for illustrations to accompany Nicholas' discussion of the Temple furnishings. Notes in at least two early hands on blanks and pastedowns, an index to the location of biblical books in a neat 15th century hand at the back of each volume, occasional marginal annotations. Goff B-612; BMC V, 197. One board with loss of about six square inches of leather, covers a little soiled and crackled, other abrasions and minor flaws, but THE BINDINGS ENTIRELY SOUND AND EXTREMELY APPEALING, particularly with their brass hardware. Some leaves in third volume slightly yellowed, first and last leaves and one other opening a little soiled, a few quires slightly affected by light dampstaining in margins, terminal leaf in two volumes with expert repair of lower corner, two leaves with a closed tear as long as three inches (into text but without loss), other defects, but all these imperfections quite minor: A FINE COPY, ESPECIALLY PLEASING INTERNALLY, THE TEXT REMARKABLY CLEAN, FRESH, AND BRIGHT. This item is a major achievement for a printer whose work was distinguished by the production of a number of important Bibles. Renner was responsible for at least two biblical firsts. In 1475, his folio edition was the first Latin Bible printed in Venice, and his 1480 Bible was the first quarto Venetian printing (it seems from Goff to be only the second Bible to be printed anywhere in that format). The present set is of considerable interest as a very well preserved incunabular Bible, and it is textually important as being only the second Bible with the "Postillae Literales" of Nicholas of Lyra, originally printed by Sweynheym and Pannartz in 1471. But apart from its condition and text, our Bible is of extraordinary interest because of the striking rubrication and especially the elaborate pious drawings seen here. The two illustrations of bleeding crosses constitute rare and striking manifestations of the tradition of what is known as the affective piety movement of the late Middle Ages, when there was an increased identification among mystics with the pain felt by Christ on the cross, and an attempt to experience the stigmata through meditation. Many of these mystics were women, often nuns. The devotion to Christ's passion evinced by our illustrations, combined with the naÃ¯ve style, which argues that the artist had not received as much formal training in painting as men received in monasteries, make it not unlikely that they are the work of a cloistered woman. The decoration here is closely related to a group of German colored pen drawings of the same period that, because they are either known, or presumed, to have been made by nuns, are commonly called "Nonnenarbeit," or "nuns' work." Our drawings and this corpus of German nuns' art reflect contemporaneous feminine spirituality with its emphasis on the wounds and suffering of Christ, as well as a devotion to the heart of Jesus. In the German-speaking world, the latter was particularly associated with 13th century mystics in the convent of Helfta in Saxony; the work of one of its number, Mechthild of Hackeborn, circulated in vernacular versions in German convents by the 15th century. The relationship between the probable decoration of our Bible by a nun and this larger cultural context is reflected especially by the more elaborate of the two drawings, an emblematic, rather than a narrative, representation of the Crucifixion. Although the instruments of the passion (the nails, crown of thorns, sponge soaked in vinegar, soldier's spear) are present, only the heart and blood, which so expressionistically drips from the cross itself, relate to Christ's humanity. The flowers beneath the cross, irrigated, as it were, by the Savior's blood, are also found in other drawings attributed to nuns. Finally, these images made by nuns are thought to have had a devotional function, and that appears to be the case with our Bible as well, for the marginal decoration of the creation account at the beginning of Genesis ends with a banderole inscribed with a prayer that is touching in its simple faith: "May he who created heaven and earth grant me eternal life. Jesus and Mary, my hope." Most known examples of "Nonnenarbeit" are found on single sheets of vellum or paper or, more rarely, as an integral part of a manuscript written by a nun. The presence of such images in an incunable, especially a scholar's Bible like the present item, is apparently very unusual. (For another 15th century drawing very similar in style and iconography, see the exhibition catalogue "Die Graphiksammlung des Humanisten Hartmann Schedel," Munich, 1990, cat. #21, pl. 8; for these drawings by nuns in general, see Jeffrey F. Hamburger, "Nuns as Artists," Berkeley, 1997.). [Westminster: Caxton Folio (27.6 cm, 10.9"). 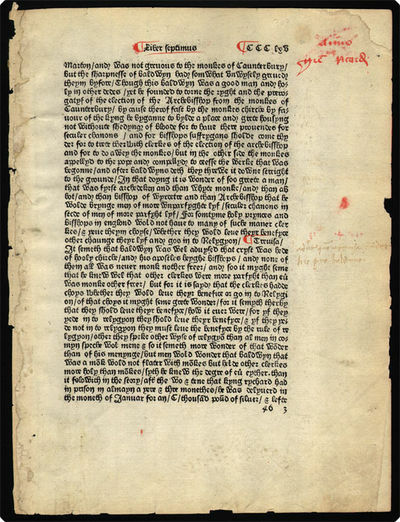 1 f.. 1482] Leaf from the first edition of the Polychronicon, a universal history covering antiquity through then-contemporary Britain, printed by William Caxton between 2 July and 8 October 1482. The text is printed in a handsome lettre bâtarde and rubricated in red, with two early annotations in Latin, one in red and another in sepia. Disbound, now in Mylar folder; outer corners restored, edges chipped, light spots of dust-soiling in margins, evidence at inner margin of having been mounted in album or other volume. Rubrication at some points showing through paper overleaf. => An attractive specimen of the premier English printer's work. [Westminster]: William Caxton, [after 2 July, 1482].. THE FIRST EDITION, Caxton's longest and most ambitious printing project. A COPY WITH OUTSTANDING PROVENANCE AND IN A SUPERB AND IMPORTANT BINDING OF FULL RED MOROCCO. 40 lines & headlines; bastarda type 4:95; Double column, black letter, beautifully rubricated throughout in red, including six and seven line initials. Small folio, in a rich and quite extraordinary mid 18th century binding unquestionably bound for James West, to his designs, in full red morocco. The boards feature a large ornamental gilt framework border identical to that used on his copy of the Caxton Chaucer (now called the Remington Chaucer and one of the most valuable English books to have ever sold at auction). 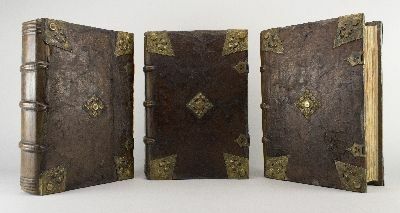 This binding is known to have been replicated on at least 5 Caxton printings from West's collection of English incunabula and for his personal collection and library. The elaborately gilt tooled spine features five raised bands separating magnificently designed gilt compartments executed in the architectural "Gothic Window" pattern designed by Mr. West and identical to those used on a number of his books. The design most likely was established to mimic the windows of the owner's library at Alscot. Two gilt lettered and gilt decorated green morocco labels fill two compartments, there is giltwork to the board edges and gilt dentelles at the turn-ins, and all edges are gilt. The original blue endpapers and silk marker are intact. 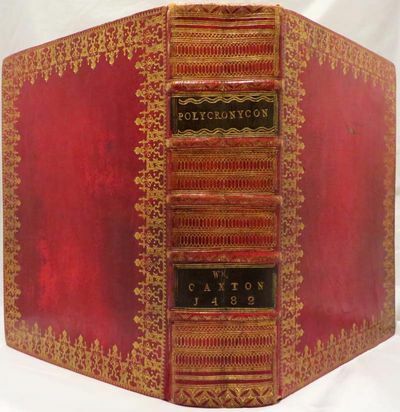 This is clearly a binding of importance and once a part of one of the greatest Caxton collections ever assembled, much of which was purchased by the King of England for his royal library at the sale of West's collection in the late 18th century. 364 ff (of 450), nearly complete as to the text of the 'Polycronicon' but without, as is often true, the preliminaries, Book VIII, 18 text ff and 3 blanks. Mentioned lacking pages are: a1-8, b1-8, C1-4,11-5 and 8, 2 1-8, 3 1 and 8, 41, 27 2 and 4-8, [A]2, 46 5, 49 4, 50.52 1-8,53 1-8, 54 1-8 and 55 1-8. A HIGHLY IMPORTANT BOOK and an extremely handsome and very pleasing copy of this rare and early work, in a binding of significance and importance. With scholarly and abundant early manuscript notations throughout in English, generally a bit cropped, a few margins strengthened, some expected minor staining, first ff loosening, hole in blank inner margin of quire 28, CCClxxxvj torn with loss of a few letters. THE VERY RARE FIRST EDITION OF THIS CLASSIC ENGLISH INCUNABLE PRINTED BY ENGLAND?S FIRST AND MOST FAMOUS PRINTER, WILLIAM CAXTON. THE POLYCRONICON was the most influential universal chronicle distributed in Britain during the 14th and 15th centuries. ISTC records 45 copies worldwide of which only 29 are complete. This beautiful copy nearly complete as to the text of the chronicle is certainly one of the last and most significant of the larger Caxtons to appear on the market The magnificent copy, with its binding especially prepared for James West's highly important collection of English incunabular printing, is of the greatest importance. THE POLYCRONICON as originally written by the Benedictine monk Ranulf Higden was a world history dating from the Creation up to 1360 A.D.. It is composed of seven books, in respect and honouring of the seven days of the creation as presented in the Book of Genesis. The work offered a clear and original picture of history as based on the medieval tradition. The English translation of the work, by John Trevisa, was commissioned by Thomas, Lord Berkeley and modernized by William Caxton in his edition printed in 1482. Caxton also added a final book, to bring the history up to the current date. WITH OUTSTANDING PROVENANCE, THIS IS THE JAMES WEST COPY. IT IS FULLY ANNOTATED BY AN ENGLISH 16TH CENTURY READER. For his edition, Caxton modernized the translation and added the eighth and final book in order to cover the period which had transpired since the writing of Higden's version. This final book was edited and created by Caxton through his use of the works of various other sources including Rolewinck's FASCICULUS TEMPORUM and the Brut Chronicle and most of what occupies the text printed on the last three quires (from the year 1419 onwards) is reprinted from his own edition of CHRONICLES OF ENGLAND (1480). The work draws on over 40 sources, and synthesizes a continuous diachronic and multicultural history, beginning with the Biblical account of the Creation and moving through the history of the Semitic, Hellenic, Roman, and medieval-European cultures. It served as a model for innumerable later histories, both universal and localized. The POLYCRONICON was Caxton's most ambitious printing project. It is his longest book in terms of page count, and the second-longest in terms of word count (after the GOLDEN LEGEND of 20 November 1483). It is also Caxton's most ambitious work as an editor and a writer; for Caxton significantly revised the extant English translation of the POLYCRONICON, updating its terminology considerably; and he also authored an original history of England to serve as Book 8 of the text--a writing effort which stands as Caxton's greatest achievement as an author. EVEN FROM THE EARLIEST TIMES IN THE COLLECTING HISTORY OF BOOKS PRINTED IN ENGLISH, THE CAXTON PRINTINGS WERE THE MOST REVERED. AND ALL COPIES WHETHER ABSOLUTELY COMPLETE OR LACKING LEAVES HAVE BEEN CONSIDERED PRECIOUS. This copy from one of the most famous collections of Caxton printings ever assembled in a binding for James West with tooling designed specifically for his library is of great importance. West's "Bibliotheca Westiana" was a magnificent repository of over 30 examples, 34 of which sold at the noted 1773 auction. A great many of West's books sold to King James III. This copy, which is not the copy sold to the King is one of three copies (posited) which he owned. An imperfect copy belonging to West is recorded as being sold in 1776 to R. Willett, and was sold again in 1813 to the Duke of Devonshire. In 1815 a copy described as Devonshire's duplicate sold to an unrecorded buyer. And as the present copy is not the duplicate as described in the Devonshire library by the turn of the 20th century, so it may be that the Duke of Devonshire's duplicate, which was described as being bound also in red morocco was bought by and belonged in 1817 to the Earl of Carlisle at Naworth Castle. The tools used to decorate the covers of the present copy match precisely those that that were used for the binding on West's copy of the Caxton Chaucer. That book, also incomplete, became one of the most expensive and important English printed books ever sold at auction. The spine tooling, designed to mirror the Gothic window panes of West's library was used on a number of his most important books. For the books of the library bound in brown calf the designs of the windows were tooled onto green leather labels while on those bound in red morocco, such as this wonderful copy of the POLYCRONICON, one of the earliest of all books printed in English, the designs were tooled directly onto the morocco of the spine panels. Strassburg: Drucker des Entkrist nicht nach Type 1 1482 - Einspaltiges, 34 -zeiliges O-Inkunabelblatt mit einem altkolorierten Holzschnitt (13,1 x 8,4 cm), einer 4-zeiligen Holzschnittinitiale, Seitenzahl von alter Hand, etwas fingerfleckig im Rand, mit kl. altrestaurierten Einrissen. Blattgröße: 20,4 x 27 cm. Incunabula text woodcut leaf. Sehr selten! Ausdruckstarker Holzschnitt (Geldner I 1968, 67). Mit den Heiligenlegenden des Athanasius (um 295 - 373) und Hieronymus (347 - 420) beginnt die, im Verlaufe der Jahrhunderte, ständig erweiterte Sammlung von Lebensbeschreibungen, Lehrgesprächen, Anekdoten, Parabeln und Ermahnungen, der in den Wüsten Ägyptens lebenden Eremiten und Mönchsgemeinschaften. Die Altväter-Literatur gehört zu den grundlegenden Schriften der monastischen Bewegung des Abendlandes. So schreibt die Benediktinerregel für die Zeit nach dem Mittagessen vor: "et legat unus collationes vel vitas patrum aut aliud quod aedificet audientes" zur Erbauung und Erziehung aus der "Vitaspatrum" vorzulesen. (Aderlass und Seelentrost 2003, 216) Der unbekannte "Drucker des Entkrist" druckte vom "Leben der Altväter" auch eine Ausgabe in niederdeutscher Sprache (H 8609). Im Jahre 1513 verwendete der Drucker Hupfuff die Holzschnitte dieses Werkes erneut (vgl. Artikel-Nr. 7104). Vitas patrum, deutsch. Leben der heiligen Altväter. Blatt "Hie lert Sant Anthonius den keiser constantinum" (GWM 50904, HC 8603). Strassburg: Drucker des Entkrist nicht nach Type 1 1482 - Einspaltiges, 34 -zeiliges O-Inkunabelblatt mit einem altkolorierten Holzschnitt (13,1 x 8,4 cm), einer fünf-zeiligen Holzschnittinitiale, Seitenzahl 24 von alter Hand, etwas fingerfleckig im Rand. Blattgröße: 19,6 x 26,7 cm. Incunabula text woodcut leaf. Sehr selten! Ausdruckstarker Holzschnitt (Geldner I 1968, 67). Mit den Heiligenlegenden des Athanasius (um 295 - 373) und Hieronymus (347 - 420) beginnt die, im Verlaufe der Jahrhunderte, ständig erweiterte Sammlung von Lebensbeschreibungen, Lehrgesprächen, Anekdoten, Parabeln und Ermahnungen, der in den Wüsten Ägyptens lebenden Eremiten und Mönchsgemeinschaften. Die Altväter-Literatur gehört zu den grundlegenden Schriften der monastischen Bewegung des Abendlandes. So schreibt die Benediktinerregel für die Zeit nach dem Mittagessen vor: "et legat unus collationes vel vitas patrum aut aliud quod aedificet audientes" zur Erbauung und Erziehung aus der "Vitaspatrum" vorzulesen. (Aderlass und Seelentrost 2003, 216) Der unbekannte "Drucker des Entkrist" druckte vom "Leben der Altväter" auch eine Ausgabe in niederdeutscher Sprache (H 8609). Im Jahre 1513 verwendete der Drucker Hupfuff die Holzschnitte dieses Werkes erneut (vgl. Artikel-Nr. 7104). Strassburg: Drucker des Entkrist nicht nach Type 1 1482 - Einspaltiges, 34 -zeiliges O-Inkunabelblatt mit einem altkolorierten Holzschnitt (13,3 x 8,4 cm), einer 4-zeiligen Holzschnittinitiale, Seitenzahl 139 von alter Hand und kleiner Randglosse. Blatt etwas fingerfleckig. Blattgröße: 20,4 x 28 cm. Incunabula text woodcut leaf. Sehr selten! Ausdruckstarker Holzschnitt (Geldner I 1968, 67). Mit den Heiligenlegenden des Athanasius (um 295 - 373) und Hieronymus (347 - 420) beginnt die, im Verlaufe der Jahrhunderte, ständig erweiterte Sammlung von Lebensbeschreibungen, Lehrgesprächen, Anekdoten, Parabeln und Ermahnungen, der in den Wüsten Ägyptens lebenden Eremiten und Mönchsgemeinschaften. Die Altväter-Literatur gehört zu den grundlegenden Schriften der monastischen Bewegung des Abendlandes. So schreibt die Benediktinerregel für die Zeit nach dem Mittagessen vor: "et legat unus collationes vel vitas patrum aut aliud quod aedificet audientes" zur Erbauung und Erziehung aus der "Vitaspatrum" vorzulesen. (Aderlass und Seelentrost 2003, 216) Der unbekannte "Drucker des Entkrist" druckte vom "Leben der Altväter" auch eine Ausgabe in niederdeutscher Sprache (H 8609). Im Jahre 1513 verwendete der Drucker Hupfuff die Holzschnitte dieses Werkes erneut (vgl. Artikel-Nr. 7104). Basel Michael Wenssler 6 Dezember (Type 4 und 6) 1482 - O-Inkunabelblatt mit ganzseitigem Holzschnitt (9,8 x 15,2 cm) auf festem Papier mit hälftigem Wasserzeichen. Blatt etwas gebräunt. Blattgröße: 14,2 x 19,2 cm. Incunable woodcut leaf Der Holzschnitt zeigt auf der linken Seite den Bischof Conradus (Konrad), den Patron des Bistums Konstanz, in der Mitte Maria mit dem Jesuskind und rechts den Diözesanpatron Sankt Pelagius. In der Mitte oben ist das Wappen des Bischofs Otto IV. von Konstanz. Links davon das Wappen seines Vaters Eberhart, Truchseß von Waldburg und Graf von Sonnenberg. Rechts davon das Wappen der Mutter Kunigunde, Gräfin von Montfort. Selten! Rar! Die Theorie der Parallellinien von Euklid bis auf Gauss, eine Urkundensammlung zur vorgeschichte der nichteuklidischen Geometrie ...Leipzig: Teubner, 1895. Basel, Michael Wenssler, 6. Dezember 1482. (Type 4 und 6). O-Inkunabelblatt mit ganzseitigem Holzschnitt (9,8 x 15,2 cm) auf festem Papier mit hälftigem Wasserzeichen. Blatt etwas gebräunt. Blattgröße: 14,2 x 19,2 cm. Incunable woodcut leaf. Der Holzschnitt zeigt auf der linken Seite den Bischof Conradus (Konrad), den Patron des Bistums Konstanz, in der Mitte Maria mit dem Jesuskind und rechts den Diözesanpatron Sankt Pelagius. In der Mitte oben ist das Wappen des Bischofs Otto IV. von Konstanz. Links davon das Wappen seines Vaters Eberhart, Truchseß von Waldburg und Graf von Sonnenberg. Rechts davon das Wappen der Mutter Kunigunde, Gräfin von Montfort. Selten! Rar! Paris: Jacques Langlois. 1st Edition. Hardcover. Very Good. FIRST EDITION, the preferred issue in Italian, of Da Vinci&#39;s first published work, the major art treatise of the Renaissance and one of the first attempts to define and understand the scientific laws of painting. A beautiful, wide-margined copy in full contemporary vellum. "Leonardo&#39;s writings and notes long remained in manuscript. Shortly after his death an industrious compiler brought together those passages from his posthumous papers dealing with painting and combined them into a Treatise of Painting (Trattato della pittura); but this important manuscript, which also preserves much that is no longer to be found in Leonardo&#39;s own notes, was only edited and published in the 17th century in France" (E.H. Gombrich, The Literature of Art).Â Â Begun in 1482, when Da Vinci&#39;s creative powers were reaching their peak, the Treatise of Painting represents the fullest expression of the master&#39;s aesthetic theory. The first edition of the Treatise is an exquisitely printed book, with engraved portraits of Leonardo and Alberti (whose work is addressed in the second part of the book), over seventy engraved illustrations and diagrams (believed to be the work of the great Nicolas Poussin), and numerous engraved initials and vignettes.Â Â Provenance: With bookplate on front pastedown of Lady Frances Scott, presumably the owner of Douglas House (Petersham), the daughter of Francis Scott and wife of Archibald Douglas, 1st Baron Douglas. WITH: Il tratto della statua di Leon Battista Alberti (as usual). Paris: Jacques Langlois, 1651. Folio, contemporary full vellum with blind-stamped decoration on boards; custom half-morocco box. Top joint cracked but holding, boards a little bowed. Text with extremely wide margins and exceptionally clean. A beautiful copy, most rare in this condition in full contemporary binding. Bartolomé de Vercellis & Bonino de Boninis, 1482 & 1481 (20 de diciembre) y 1482 (7 de febrero), Brescia & Verona: - 1: 181 hojas (sin la blanca *2) 2: 58 hojas (sin las dos blancas finales). 3: 94 hojas (sin las dos blancas *1 y g4). Encuadernación del siglo xix en piel de Rusia con decoración dorada. 1: Hain & Copinger (+ Add) 3245*. Goff B-704. BMC VII 966. BSB-Ink B-555. GW 4425. IGI 1762. IBE 1082. 2: Hain & Copinger 3243* + 3247*. Goff B-702. BMC VII 951. BSB-Ink B-554. GW 4423. CIBN B-498. IGI 1760. IBE 1081. Payne & Foss, libreros de Londres, vendido en 1829 por 12 libras y 12 chelines, John Hayford Thorold and Syston Park, vendido en 1884. Ridler. Lord Wardington. Extraordinario ejemplar con todos los márgenes. Dos incunables en un volumen.La Roma triumphans, es un tratado de historia escrito en 1458 y dedicado al papa Pío II. Relata las costumbres y a la vida social de los antiguos romanos. esta edición de Brescia es la segunda (después de la de Mantua ca. 1473).Segunda edición también de la Roma instaurata y como la 'triunfante' con el espíritu del humanista pleno que quiere acercar la vida de Roma y promover la reconstrucción de su historia. Roma instaurata es un recorrido erudito, minucioso, delicado y fundamental por la ciudad antigua de Roma.Fue obra de superior importancia y se publicó por primera vez en 1471 ca. Por su parte, el De origine et gestis venetorum es una de las más importante crónicas históricas de la Historia de Venecia y aparece aquí en primera edición. Roma Illustrata es una descripción geográfica de la Italia antigua, de las provincias y estados romanos: Etruria, Lombardía, Campania, Apulia, Venecia, los Abruzzos. con anotación de los hijos predilectos, fechas importantes, conquistas y batallas, importancia histórica y cultural de las ciudades y relaciones de las mismas que han dado los escritores romanos, desde Julio César a Plinio. En conjunto una de las cimas entre las pasiones históricas del Renacimiento italiano, de mano de su más sensato representante: Flavio Blondo es también autor de la primera historia de la Edad Media. Ver su Historiarum ab inclinatione romanorum imperii decades, publicada en 1483 en Els Llibres del Tirant, catálogo 11. 3 partes encuadernadas juntas en un in-folio (30,7 x 20 cm). Johannes de Nordlingen et Henricus de Harlem 3 Oct. 1482 HUGO, SENENSIS (Ugo Benzi). Consilia ad diversas aegritudines. (Bologna). Johannes de Nordlingen et Henricus de Harlem, 3 Oct. 1482. In - folio, pergamena ottocentesca. 104 ff. Testo a due colonne, 44 linee, tipi 180 g e 91 g. Prima iniziale miniata, le seguenti libere con lettera guida. Bell' esemplare completo dei due ff. di indice che mancano quasi sempre. Edizione bolognese estremamente rara, pubblicata a cura di Lorenzo Gozzadini, sconosciuta a Hirsch (I, 465) che cita soltanto la ristampa del 1518. UGO BENZI (c. 1370 - 1439), called Hugh of Siena, was Professor of Medicine at Siena, then at Bologna and at Parma, and appear to have give lectures at the Sorbonne. Returning to Italy, he was called by Nicholas III to Ferrara, where he took part in the celebrated Council of 1417. He was perhaps the best interpreter of the ancien medical writers amongst his contemporaines. His Consilia are of interest on account of their clinical reports. (Lier). H. - C., 9020. Klebs, 1001.1. I.G.I., 4941. Proctor, 6558. B.M.C. VI, p. 819. Goff, H - 538 (una sola copia in U.S.A.). Manca a Osler, Wellcome, Cushing, Waller e a quasi tutte le grandi biblioteche mediche. (Venice, Erhard Ratdolt, 1482).. Early edition (1482), small folio, approximately 265 x 175 mm, 10Â½ x 7 inches, LACKING 8 LEAVES AT THE END INCLUDING COLOPHON, AND LACKING INITIAL BLANK, 60 woodcuts in the text, all but 2 of buildings or cities, one of Venice showing the Doge&#39;s Palace and gondolas, some of middle eastern buildings, the Tower of Babel, Jerusalem, Syracuse, Lyons, Cologne, Milan, 2 of Jesus Christ. Some buildings are repeated for different places. The text, printed in black letter, is divided by rules with significant names set within double roundels Collation (no signatures): 7 of 8 unnumbered leaves containing complete index, missing is the initial blank, no title page called for, index followed by 56 of 64 leaves numbered on rectos only, missing 8 leaves of text (57-64) and colophon which was on folio 64 verso. Bound in 19th century panelled calf, blind rules and trefoil motifs at corners, blind motifs to spine and gilt lettered tan morocco label, all edges red. Spine very slightly faded, a few minor marks to covers, corners and top edges slightly rubbed, small neat manuscript note on verso front endpaper plus a small private library number label, a second tipped-in endpaper has more manuscript speculation on the printer and date, minute chip to top edge of first 16 leaves neatly repaired, some small light marginal stains, tiny worm track to inner margin of a few pages, not affecting text, wormhole starting on fo. 42 and continuing to final page, affecting a letter on 4 pages, but no loss of legibility, large damp stain to upper corner of last 4 leaves, showing heavily on final leaf, pale brief marginal notes to 2 pages but these are not legible as the pages were trimmed for the rebinding, a brief note about the English Pope Joan on fo.49, very few mild underlinings, a few pointing hands, mostly clean. A defective early copy of a famous illustrated incunable chronicle. Werner Rolewinck (1425-1502), a native of Westphalia, was a learned Carthusian monk, author of about 50 works, most notably this history of the world from the creation to Pope Sixtus IV, first published in Cologne in 1474. It was an enormously popular world chronicle, appearing in more than 30 incunable editions in Latin, German, French, and Dutch. Polain, Livres imprimes au quinzieme siecle des bibliotheques de Belgique, 3374; Goff, Incunabula in US Libraries, R264; Hain, Repertorium Bibliographicum, Volume I, Part II, 6928. MORE IMAGES ATTACHED TO THIS LISTING, ALL ZOOMABLE. FURTHER IMAGES ON REQUEST. POSTAGE AT COST. Kst.- Karte, v. Nicolo Tedesco n. Francesco Berlinghieri, "Tabvla Seconda de Asia".
. koloriert, 1482, 37,5 x 40 ( leichte Trapezform ). Rarissimum. - Eine der Ã¤ltesten gedruckten Karten der Ukraine und Russlands. Aus der 3. Ausgabe der Geographie des PtolemÃ¤us, hier vorliegend in einem schÃ¶nen Kolorit, die Einfassung mit GoldhÃ¶hung. Alle Karten dieser Ausgabe sind von 2 Platten gedruckt. Daher ist die vorliegende Karte aufgezogen. -Francesco Berlinghiere (1440 - 1501 ) wurde in Florenz geboren. Er war Lehrer und Humanist. Ab 1464 begann er sich mit den Karten des PtolemÃ¤us zu beschÃ¤ftigen. Im Jahr 1482 erschien dann sein Werk: "Septe giornate della Geographia" mit den Karten des PtolemÃ¤us, aber auch 4 "modernen" Karten ( Frankreich, Italien, Spanien und PalÃ¤stina). Diese kommentierte er in Versform in italienischer Sprache. - Bekannt sind noch 2 frÃ¼here Ausgaben der PtolemÃ¤uskarten a) Bologna (1477) und b) Rom (1478); Karten aus diesen Ausgabe sind allerdings auf dem Markt unauffindbar. Preclarissimus liber elementorum Euclidis perspicacissimi: in artem geometrie incipit quamfoelecissime. [Colophon:] Vicenza: Leonardus de Basilea and Gulielmusde Papia, 20 June 1491. FASCICULUS TEMPORUM OMNES ANTIQUORUM CRONICAS COMPLECTENS INCIPIT FOELICITER. (Venice, Erhard Ratdolt, 1482).Small folio, approximately 265 x 175 mm, 10½ x 7 inches, LACKING 8 LEAVES AT THE END INCLUDING COLOPHON, AND LACKING INITIAL BLANK, 60 woodcuts in the text, all but 2 of buildings or cities, one of Venice showing the Doge's Palace and gondolas, some of middle eastern buildings, the Tower of Babel, Jerusalem, Syracuse, Lyons, Cologne, Milan, 2 of Jesus Christ. Some buildings are repeated for different places. The text, printed in black letter, is divided by rules with significant names set within double roundels Collation (no signatures): 7 of 8 unnumbered leaves containing complete index, missing is the initial blank, no title page called for, index followed by 56 of 64 leaves numbered on rectos only, missing 8 leaves of text (57 - 64) and colophon which was on folio. 64 verso. Bound in 19th century panelled calf, blind rules and trefoil motifs at corners, blind motifs to spine and gilt lettered tan morocco label, all edges red. Spine very slightly faded, a few minor marks to covers, corners and top edges slightly rubbed, small neat manuscript note on verso front endpaper plus a small private library number label, a second tipped in endpaper has more manuscript speculation on the printer and date, minute chip to top edge of first 16 leaves neatly repaired, some small light marginal stains, tiny worm track to inner margin of a few pages, not affecting text, wormhole starting on fo. 42 and continuing to final page, affecting a letter on 4 pages, but no loss of legibility, large damp stain to upper corner of last 4 leaves, showing heavily on final leaf, pale brief marginal notes to 2 pages but these are not legible as the pages were trimmed for the rebinding, a brief note about the English Pope Joan on fo.49, very few mild underlinings, a few pointing hands, mostly clean. A defective early copy of a famous illustrated incunable chronicle. Werner Rolewinck (1425 - 1502), a native of Westphalia, was a learned Carthusian monk, author of about 50 works, most notably this history of the world from the creation to Pope Sixtus IV, first published in Cologne in 1474. It was an enormously popular world chronicle, appearing in more than 30 incunable editions in Latin, German, French, and Dutch. Polain, Livres imprimes au quinzieme siecle des bibliotheques de Belgique, 3374; Goff, Incunabula in US Libraries, R264; Hain, Repertorium Bibliographicum, Volume I, Part II, 6928. MORE IMAGES ATTACHED TO THIS LISTING. POSTAGE AT COST. Legenda aurea, deutsch (Heiligenlegende, Legende der Heiligen). Sommerteil "Das XCV. plat" von "Sant Theonesto und Albano ir leben" (GWM 11366, H 9977). Augsburg, Johann Schönsperger, 2. Dezember 1482. Type 1.. Einspaltiges, 34-zeiliges O-Inkunabelblatt mit einem altkolorierten Holzschnitt (5,9 x 8,2 cm) mit Bischof Theonestus und dem Heiligen Albanus. Blatt im Randbereich etwas braunfleckig. Wasserzeichen Ochsenkopf. Blattgröße: 16 x 23,7 cm. Incunable woodcut leaf.. Seltenes Inkunabelblatt! Poetica astronomica, Poeticon astronomicon. Blatt G 7. (Herausgegeben von Jacobus Sentius und Johannes Lucilius Santritter). (GWn 0374, HC9062). Venedig, Erhard Ratdolt, 14. Oktober 1482.. Einspaltiges, (31-zeiliges) O-Inkunabelblatt (one leaf) mit zwei 5-zeiligen Holzschnittinitialen sowie zwei halbseitigen Holzschnitten des "Mercurius" und "Juppiter". Im oberen Randbereich etw. gebräunt und im unteren Bereich etw. fingerfleckig. Wasserzeichen: Stern auf Standarte. Blattgröße: 14,3 x 20,4 cm. Incunabula text woodcut leaf. Es steht noch ein weiteres Blatt aus diesem Werk, mit der Darstellung der Venus zur Verfügung; zu einem Preis von 380.- Euro.. Blatt der Editio Princeps. Das Poeticon Astronomicon war eine der ersten antiken Quellen der Sternenkonstellationen; es war die erste gedruckte, rein astronmische Schrift, die hier in einem Blatt der Erstausgabe vorliegt. In der Renaissance wurde das Werk dem römischen Historiker C. Julius Hyginus zugeschrieben, der im 1. Jahrhundert vor Chr. lebte. Heute wissen wir, dass es von einem anderen Hyginus zusammengestellt wurde. Die Ordnung der Konstellationen folgt dem Katalog in Ptolomäus "Almagest", sodass das Werk im dem 2. Jahrhundert n. Chr. entstanden sein kann. Das Poeticon wurde erstmals 1482 gedruckt. Vita maravigliosa cauata da quella che si ha nelle Opere Latine d'esso B. Padre, e dal molto illustre... Scipion Buri... Diretta a tutte le persone Religiose, & in particolare alle Sacre Vergini. Verona, Bartolomeo Merlo 1625. 8°. 90 (recte 92) num. Bll., Titel mit Holzschn.-Vign., Prgt. d. Zt. mit hs. Rtit. . . ICCU 024365 (nur ein Exemplar in Italien: Bibl. Bertoliana Vicenza); nicht im WorldCat.- Erste italienische Übersetzung der Autobiographie des "cantore della mistica tedesca" und "ultimo poeta dell'alto medioevo tedesco" Heinrich Seuse (1295-1366) durch Scippione Buri. Der Dominikaner mußte sich auf einem Generalkapitel in den Niederlanden 1330 gegen den Vorwurf ketzerischer Lehren verteidigen, widmete sich ganz der Seelsorge, besonders in der Schweiz u. am Oberrhein. "Seuse ist der Dichter unter den dt. Mystikern, dessen Schriften einen großen Bilder- u. Gefühlsreichtum bezeugen.... Die Kenntnis seiner Werke verdanken wir hauptsächlich seiner geistlichen Tochter Elsbeth Stagel in Töss, die an der Redaktion seiner ,Vita' beteiligt war, Gespräche mit ihm niederschrieb u. seine Briefe sammelte. Seine ,Vita' ist die erste geistliche Selbstbiographie in dt. Sprache." (BBKL IX, 1482).- Tls. leicht fleckig, vorderer Innendeckel mit großer Bezugsfehlstelle, Ebd. fleckig u. etw. knittrig, vord. Ecke mit Bezugsfehlstelle. Venice, Erhard Ratdolt, 16. I. 1482.. 4to. 32 ff. Title page printed in red and black. With 2 woodcut diagrams and 8 tables in the text; white-vine initials in two sizes, lombardic initials (many coloured in red). Rubricated. Recent full vellum.. Second edition of the author's principal work, originally published at Mantua in 1473. Al-Qabisi (also known as "Alchabitus" in the Latin tradition) flourished in Aleppo, Syria, in the middle of the 10th century. Although his education was primarily in geometry and astronomy, his principal surviving treatise, "Madkhal" (here in the Latin translation of Joanis Hispalensis prepared in 1144), is an introductory exposition of some of the fundamental principles of genethlialogy (the astrological science of casting nativities, or divination as to the destinies of newborns). The "Madkhal" in its Latin version was published many times in the fifteenth and sixteenth centuries. - Bookplate of joint collectors Rudolf Hugo Driessen (1873-1957) and Caroline E. F. Kleyn (1883-1933). Outer margin of first leaf slightly frayed; marginal annotation in red ink on its verso (slightly trimmed by binder's knife). Very rare; last sold at an international auction in 1996. - HC 616*. Goff A-362. GW 843. Essling 294. Sander 216. Sajo-Soltesz 120. Walsh 1804. Oates 1747. Proctor 4382. BMC V 285, XII, 19. BSB-Ink A-232. (Lyon, Nikolaus Philippi und Markus Reinhard, 1. Februar) 1482.. 103 Bll. (von 112). Mit 49 (von 54) altkolorierten Holzschnitten; nahezu durchgehend in Rot rubriziert und rote Lombarden; Druck in 53-56 Zeilen und 2 Spalten. 2° (24 x 17,5 cm). Moderner schwarzer Lederband auf Holzdeckeln, mit reicher Blindprägung und einer alten Leder-Messing-Schließe.. Es fehlen die Bll. a1 (leer), a4, a5, b1, c5, d6, C1, E9 und E10 (beide leer). a2 angegraut und am Kopf angerändert; a3 mit Einriss (hinterlegt, kein Textverlust); e2 mit Randeinriss (hinterlegt); g5 mit Eckabriß; A2 mit Tintenfleck; E4 mit kl. Randläsur; E8 mit kl. Eckabriss; auf einigen Bll. Farbdurchklatsch; zu Beginn gering fingerfleckig. Der Evangelien-Teil befindet sich vor dem Epistel-Teil: "Mit der textlichen Anordnung dieser Ausg. hatten die Drucker offenbar Schwierigkeiten. Das Impressum findet sich am Schluss des 1. Teils (Super evangelia) <=i6>. die Vorrede schließt den 2. Teil (Super epistolas) ab. Es handelt sich hier also nicht um eine Willkür des Buchbinders bei der Zusammenstellung der Teile (...)." (GW 11984). Kolophon: "Postilla super epistolis et euangeliis dominicalibus ac festiuitabit de sanctis per anni circulum secundum sensum litterale collecta finit feliciter Sub anno domini. Millesimo Quadriingentesimo Octogesimo secundo". In der Vorrede (E8: "Vitam bonam exitu beatum. Ego frater guillerm sacre professor minim parisi educat") benennt Guillelmus die Prinzipien und Quellen von Edition und Kommentaren. Die Texte der Postilla entstanden wahrscheinlich 1437 und 1439 und werden Johannes Herolt (+ 1464 in Nürnberg) zugeschrieben). In vorliegender Ausgabe, bei der Text und Kommentar eingearbeitet sind, wurden ihnen zum ersten Mal die Holzschnitte beigegeben, die aus den "Plenarien" des Martin Schott (1481) stammen, allerdings nicht vollständig und in anderer Anordnung. Die Postilla war ein Bestseller der Inkunabel-Zeit: GW führt insgesamt mehr als 100 Ausgaben an! Der Einband ist ein Paradestück moderner Einbandkunst und ganz im Stil der französischen Frührenaissance (angefertigt von Genevieve von Hahn, Frankfurt): Die reiche Blindprägung (Streicheisen, 4 verschiedene Rollstempel) wurde mit altem Werkzeug ausgeführt, die ziselierte Messing-Schließe und ihr Anker auf dem Hinterdeckel sowie dessen Befestigungsnagel sind ebenfalls alt und geben mit ihren Dekoren den Schmuck von Deckel und Rücken vor (Rauten und Blumen). Umlaufend sind die Deckel von einem erhaben prägenden Rollstempel eingerahmt: Grillen, Käfer und Libellen in einem Rankenwerk. Abbildungen auf Anfrage als email. Vitae Spiritualis et Vitae Matrimonialis etc. etc. BRUUN, CHR. V. & NIELSEN, LAURITZ & DAL, ERIK. Venice: Erhard Ratdolt, , 1482. Chancery folio (305 × 207 mm), 137 unnumbered leaves, without the final blank. Old vellum boards panelled in gilt, skilfully rebacked to match. Housed in a flat back cloth solander box made by The Chelsea Bindery. White-on-black woodcut border and red printed headline to a2r, white-on-black woodcut initials, geometric typemetal marginal diagrams throughout. First two lines of a2r (printed in red) follow BMC&#39;s transcription for the copy at IB.20513; line 45 of o8r has the corrected setting of the text: "culi prostrati sed non sunt adinuicem equales. hoc aut scies si perpendiculares a" - cf. Curt M. Bühler, "A typographical error in the editio princeps of Euclid", &#39;Gb Jb&#39; (1966), p. 102-104. Sig. a1 extended at top margin and with skilful repair to central vertical tear without loss, minor worming to first four quires and from sig. n3 to end (mostly a single hole at end); toning and light spotting to early and late leaves, a few small spots to contents, else clean and bright; overall, a very good copy. First edition of &#39;the oldest mathematical textbook still in common use today&#39; (PMM) and one of the earliest printed books with geometrical figures. The text is the standard late mediaeval recension of Johannes Campanus of Novara, based on the 12th-century translation from the Arabic of Adelard of Bath. The text is preceded by a dedicatory letter by Erhard Ratdolt to Giovanni Mocenigo. Ratdolt&#39;s method of printing diagrams to illustrate a mathematical text and his finely printed astronomical books became the models for subsequent scientific publishing. Campanus&#39;s recension of the Elements, whose earliest witness is a manuscript dated 1259, became the standard version of the high and late Middle Ages. It was based on but enlarged from the translation from the Arabic made by Adelard of Bath about one hundred twenty years earlier, the so-called Adelard version II. Campanus&#39;s recension continued to be printed at least as late as 1558. Its textual history both in manuscript and print remains to be closely studied, and there is no modern edition. Books I&#150;XIII are the Elementa proper; book XIV is the supplement of Hypsicles of Alexandria (2nd century BC) and XV the supplement assigned to the school of Isidore of Miletos, architect of Hagia Sophia (6th century AD). Goff, GW, and most of the other standard incunable literature have given to Campanus an apocryphal forename, Johannes. Ratdolt&#39;s Euclid was the first substantial mathematical work to be printed, and is one of his technically most advanced and accomplished productions. His dedication to the doge of Venice expresses his amazement that hitherto no major work of mathematics had been printed in Venice, the reason being the difficulty of supplying the diagrams without which much of mathematics, and especially geometry, can hardly be understood. He points out that, by his own invention, he has been able to remedy this, so that diagrams can now be printed "as easily as letters." These diagrams have traditionally been identified as woodcuts (BMC, GW), but it seems much more probable that they were in fact cast in typemetal. Euclid&#39;s Elements is the only writing of classical antiquity to have a continuous history of textbook use from the pre-Christian era to the 20th century. Sir Thomas Heath, editor of the standard modern edition, remarked, "No work presumably, except the Bible, has had such a reign; and future generations will come back to it again and again as they tire of the variegated substitutes for it, and the confusion arising from their bewildering multiplicity." (Venice, Erhard Ratdolt, 1482).. Small folio, approximately 265 x 175 mm, 10½ x 7 inches, LACKING 8 LEAVES AT THE END INCLUDING COLOPHON, AND LACKING INITIAL BLANK, 60 woodcuts in the text, all but 2 of buildings or cities, one of Venice showing the Doge&#39;s Palace and gondolas, some of middle eastern buildings, the Tower of Babel, Jerusalem, Syracuse, Lyons, Cologne, Milan, 2 of Jesus Christ. Some buildings are repeated for different places. The text, printed in black letter, is divided by rules with significant names set within double roundels Collation (no signatures): 7 of 8 unnumbered leaves containing complete index, missing is the initial blank, no title page called for, index followed by 56 of 64 leaves numbered on rectos only, missing 8 leaves of text (55-64) and colophon which was on folio. 64 verso. Bound in 19th century panelled calf, blind rules and trefoil motifs at corners, blind motifs to spine and gilt lettered tan morocco label, all edges red. Spine very slightly faded, a few minor marks to covers, corners and top edfes slightly rubbed, small neat manuscript note on verso front endpaper plus a small private library number label, a second tipped in endpaper has more manuscript speculation on the printer and date, minute chip to top edge of first 16 leaves neatly repaired, some small light marginal stains, tiny worm track to inner margin of a few pages, not affecting text, wormhole starting on fo. 42 and continuing to final page, affecting a letter on 4 pages, but no loss of legibility, large damp stain to upper corner of last 4 leaves, showing heavily on final leaf, pale brief marginal notes to 2 pages but these are not legible as the pages were trimmed for the rebinding, a brief note about the English Pope Joan on fo.49, very few mild underlinings, a few pointing hands, mostly clean. A defective early copy of a famous illustrated incunable chronicle. Werner Rolewinck (1425-1502), a native of Westphalia, was a learned Carthusian monk, author of about 50 works, most notably this history of the world from the creation to Pope Sixtus IV, first published in Cologne in 1474. It was an enormously popular world chronicle, appearing in more than 30 incunable editions in Latin, German, French, and Dutch. Polain, Livres imprimes au quinzieme siecle des bibliotheques de Belgique, 3374; Goff, Incunabula in US Libraries, R264; Hain, Repertorium Bibliographicum, Volume I, Part II, 6928. MORE IMAGES ATTACHED TO THIS LISTING. POSTAGE AT COST. Treviso: Johannes Rubeus Vercellensis, 1482. Hardcover. A Fine Illuminated Copy from the Finest Library in BritainOf a Sort of Book with "But Little Value" at the Time. 340 x 228 mm (13 3/8 x 9"). (of 330) leaves (including blank r6 but without initial and final blanks). Single column, 55 lines of roman type. With the Epitome of Florus; edited by Lucas Porrus. Attractive 17th century mottled calf, covers with gilt arms of Charles Spencer, 3rd Earl of Sunderland, raised bands, recently rebacked to style in brown calf elaborately gilt in compartments with intricate central fleuron and scrolling cornerpieces, red morocco label, marbled endpapers. Epitome with numerous three-line initials in red or blue, the "Decades" with 30 nine- to 11-line initials in red and blue with decorative penwork in pink, green, or black, and FOUR ILLUMINATED INITIALS in various colors on a background of burnished gold, THE TAIL MARGIN OF c4r WITH A LOVELY FLORAL VINE in blue, pink, and green accented with 16 burnished gold bezants. Front pastedown with Althorp library shelf label and book label of Kenneth Rapoport. Writing paper with inscription dated 1894 giving purchasing history tipped onto front free endpaper. Letter from Charles Bruce to "Charlotte" discussing the value of the work laid in at front (see below). Goff L-243; BMC VI, 896. Leather pitted (as always with mottled calf), a couple of tiny abrasions to upper cover, one corner lightly bumped, edges a little rubbed, but the expertly restored binding solid and appealing. First leaf faintly soiled, one leaf with tiny marginal hole (paper defect), four conjoint leaves in choir bb a bit browned, isolated minor foxing and other trivial imperfections, but A FINE, FRESH COPY with especially ample margins. This is the extremely well-preserved, especially tall Sunderland copy of a popular secular incunabular title that was the major source for Roman history throughout the Renaissance. First printed by Sweynheym and Pannartz in 1469, the "Historiae" of Livy (59 B.C. - 17 A.D.) relates the rise of Rome from humble beginnings and its triumphs in the Punic Wars through the reign of the author&#39;s contemporary, the Emperor Augustus. His account was central to historical and political thought of the time. The Livy was the second work to be printed by Johannes Rubeus Vercellensis (Giovanni Rosso of Vercelli) at Treviso, where he printed some eight or nine works between 1480 through 1485, before moving his business to Venice. There, he is thought to have issued as many as 50 incunabula, and he continued printing in Venice, partly in collaboration with other family members, until 1519. His handsome roman type is well suited to the classical authors in which he specialized. Our copy has a most distinguished provenance: it formerly belonged to one of the greatest book collectors that ever lived, Charles Spencer, 3rd Earl of Sunderland (1675-1722). In addition to a distinguished career in politics and diplomacy, which included serving as Lord Lieutenant of Ireland and First Lord of the Treasury, Spenser amassed the finest library in Britain, especially rich in early printing and in editio princeps of Greek and Roman authors. As evidenced by the two manuscript notes at the front of our volume, the present item was among the books sold when the great library was auctioned in sales during 1881, 1882, and 1883. The letter from Lord Charles Bruce (1834-97), a younger son of the Marquess of Ailesbury, informs his "Dearest Charlotte" that the Livius she has left for him to examine sold for £2.15 in the Sunderland sales, and he cautions that the price she has been asked to pay for it is too high. He notes that its value has not increased since the time of the auction, as "that class of book has but little value at present." (While his characterization of the value of incunabula would not pertain today, Bruce was apparently quite knowledgeable about early printing in his own time: for example, he presented a paper to the Library Association in 1884 on the Spencer Library at Althorp, in which he noted that Althorp held a more complete collection of Caxtons than the British Museum.) It is certainly conceivable that "Charlotte" is the scholar and translator Lady Charlotte Elizabeth Guest Schreiber (1812-95), known for translating "The Mabinogian" into Welsh. The daughter of the earl of Lindsey and the wealthy widow of an iron manufacturer, Lady Charlotte was one of the great collectors of her time, being noted particularly for her collections of porcelain, fans, and playing cards. It is clear that she had something of a library as well, as Sotheby&#39;s auctioned part of it on 20 April 1896 after her death. It is quite possible that Lord Charles is responding in his letter to the request by Charlotte for advice before purchasing the Livy. We infer this partly because she is described as asking Bruce&#39;s counsel on a personal matter in Erica Obey&#39;s biography, "The Wunderkammer of Lady Charlotte Guest" (see pp. 78-79). The scrawled note tipped onto the front free endpaper, signed with the initials "CE[? ]GS" and dated 1894, records the sale price at the Sunderland auction and notes that the writer purchased the book from Spiller for £3, a price presumably negotiated based on Bruce&#39;s advice.